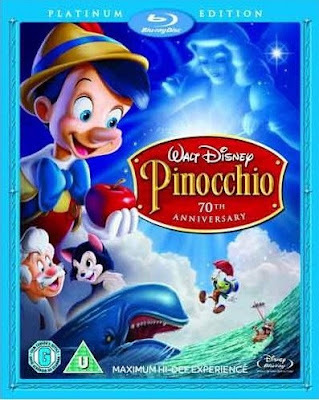 Probably the first exposure to Disney animation that I can recall as a child, I probably saw a re-release print of Pinocchio sometime in the late 1960s. This, Bambi and 20,000 Leagues Under The Sea terrified the life out of me. In fact, I vividly recall being escorted out of the cinema because I found Bambi and Leagues too traumatic an experience at such a tender age. Pinocchio is a pretty dark rites of passage story, culminating in the scene, as horrific as any horror film, where Pinocchio's bad-boy sidekick Lampwick, transforms into a donkey. It's done in a very Gothic manner with Expressionist shadows against a wall. But it's also a very tender and moving tale too, with a beautifully observed father-son relationship between Pinocchio and Geppetto, Jiminy Cricket's indomitable loyalty to the innocent and impressionable wooden boy and the grotesqueries of Stromboli who, along with the Coachman, is emblematic of the fear of the physicality of our fathers in childhood. I love Stromboli's physicality in this film, his anger literally makes the film shake. This is again a beautifully restored version for Blu-Ray. It's presented in its original 1.33:1 Academy ratio which seems to niggle some purchasers because it doesn't completely fill the frame of their widescreen telly. It's not made in widescreen and therefore it shouldn't fill the screen. What you do get is a 70 year old animated film that looks lush. It may not have the immediacy of detail that made the Blu-Ray of Sleeping Beauty such a winner but the format makes the beautifully textured backgrounds stand out and the effects animation is well highlighted here, culminating in the scene where Monstro, the giant whale, chases Pinocchio and Geppetto through the waves where the water effects are nothing short of superb and incredibly realistic in a very physical sense. The ending is still incredibly moving and can still make a grown man cry. What makes this film such a delight though is the character animation. It is leaps and bounds beyond what was achieved in Snow White and is probably some of the finest work the studio ever did. It's dynamic and detailed with perfectly observed movement. 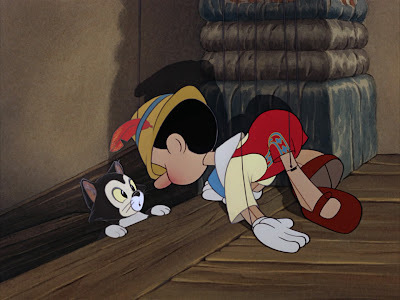 Look at the way Stromboli dominates the frame, or the detail imbued into Figaro the cat, the non-human and human version of Pinocchio and you'll see a talented team of animators surpassing themselves at the craft of character animation. 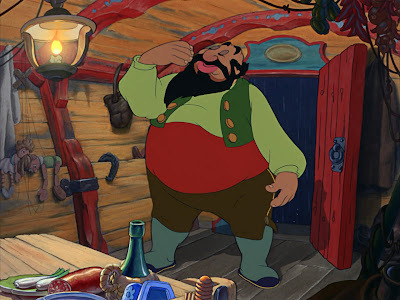 The double act of Honest John and Gideon, the two con-men who sell Pinocchio to Stromboli, is a wonderful blend of character acting, screwball physical animation and visual comedy. 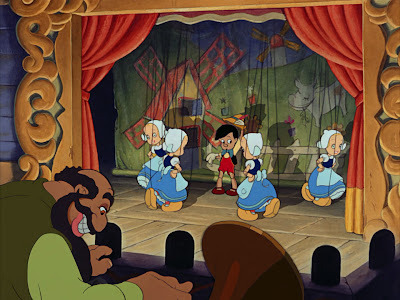 Add to this the atmosphere of Pinocchio's kidnapping in the middle of a storm, Geppetto's imprisonment in the innards of the whale, and the dark surrealism of Pleasure Island, full of bold colour and deep contrasts. And it is one of the first films that uses music and song to tell the story emotionally. Jiminy Cricket singing 'When You Wish Upon A Star' would melt the stoniest of hearts and emotionally synthesises the themes of hope, conscience and moral choice that are the centre of the film. I'm not sure the 7.1 sound mix is justified to be honest as even though there is good stereo direction there is little use of the sub-woofer to give the sound field a kick up the arse. Still, it sounds wonderful despite this quibble and doesn't detract from a superbly presented package and a film that is incredibly moving and can still make a grown man cry. An immaculate presentation of a life-affirming tale, this clearly shows what the Blu-Ray format is all about. The double disc edition comes with a huge haul of extras. The one you should aim for first of all is The Making Of, then the Cine-Explore picture-in-picture commentary. Cine-Explore Feature: Picture-in-Picture video commentary. Animator Eric Goldberg, Leonard Maltin, and J.B. Kaufman discuss the film, its impact on cinema, and its lasting influences while original storyboards, stills, and archive footage appear on screen. The commentary also has an audio-only option. No Strings Attached - The Making Of Pinocchio: At almost an hour this is a thoroughly impressive behind-the-scenes documentary, in HD, that covers some of the material in the commentary but also has loads of stuff not covered elsewhere. Deleted Song: The song "Honest John" dropped from the film presented in audio. The Sweat Box: An interesting glimpse into the animation production process where animators presented their work in progress to the boss himself, Walt Disney. Live Action Reference Footage: Live action footage used by the animation team for character references, with contextualising commentary. Galleries: Huge collection of reference materials, including drawings and photographs. Nice review, Cam. I love this DVD and will be on the look out for 'Snow White' later in the year as I believe that's the next one up for the HD treatment. i notice "the black cauldron" is getting the two~disc treatment. looking forward to that too. Yes, it's a bit of an investment. But players are coming down in price. And I started out with a PS3 as this was the cheapest way to invest in a blu-ray drive. But then you also need an HD ready screen/monitor too. I sympathise with you as I've been a poor student and similarly felt frustrated! I wish they'd hurry up and get out a blu-ray of '20,000 Leagues Under The Sea'. I'd love to see that in HD.